1 cup freshly grated cheese such as sharp cheddar, pecorino, etc. To cook rice, combine rice and 11/3 cups water with 1/2 teaspoon sea salt in a medium saucepan. Cover and place over medium heat. When rice comes to a boil, reduce heat to low and cook for 15 minutes. During the last 2 minutes of cooking, add the asparagus on top of the rice and replace the cover. Remove from heat with the cover on and let sit for 10 minutes. Whisk together the milk, chicken broth concentrate, onion powder, Worcestershire sauce, sea salt and black pepper. 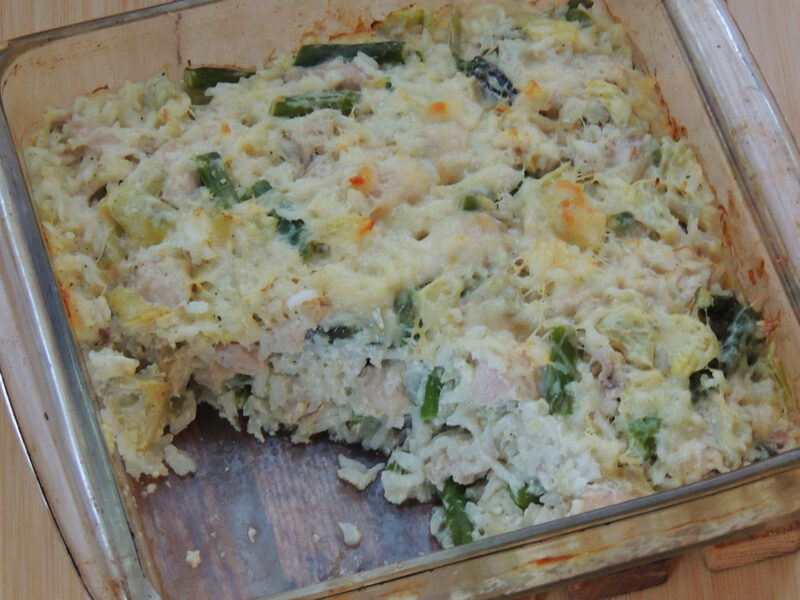 Toss the rice, asparagus, chicken, artichokes, and 3/4 cup cheese together in a bowl. Spread in a greased 8 x 8 baking pan and sprinkle the remaining cheese over the top. Bake for 45 minutes.